Home » News » FRAUD ALERT – Do not contribute. These clothes recycling bags with our logo are FRAUDS! FRAUD ALERT – Do not contribute. These clothes recycling bags with our logo are FRAUDS! 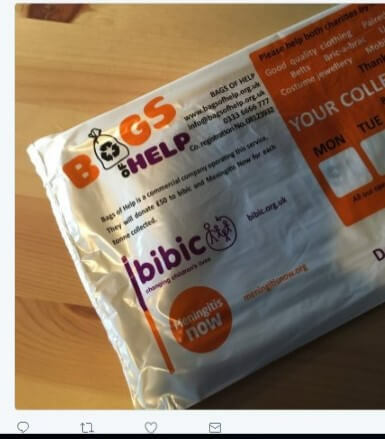 These clothes recycling bags are being distributed in the North of England and in Scotland with bibic’s logo. Please DO NOT contribute as we have NOTHING to do with this. They are being fraudulently used with our logo on. It is disgraceful to use our children’s charity like this. Action fraud and the police have been informed. If you see bags like this, please contact us immediately on 01458 253344.